Tooth-colored restorations are made from strong white resin material that can be matched to the color of the tooth being restored, making the filling nearly invisible. Tooth-colored restorations are durable, color-stable and are aesthetically similar to natural tooth color. 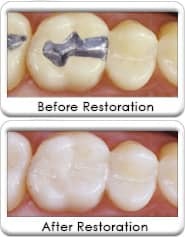 Unlike silver dental amalgam fillings that require more drilling to be securely locked into the tooth's cavity structure, tooth-colored restorations are bonded to the tooth. Less of the tooth's structure is removed resulting in a stronger filled tooth. Tooth-colored restorations are not only more more conservative on the tooth, the resin is stronger than dental amalgam fillings. Tooth-colored resin material comes in many shades and is matched to your tooth's color. The material for the front teeth has a high shine to match and is designed for strength for the back teeth. Tooth-colored restorations look natural and can be unnoticeable. Small tooth-colored fillings can last a lifetime. Larger fillings should be expected to last many years. The Biting force on the filling, size of the filling relative to the tooth, dental maintenance and the cleaning method are all factors that determine the life span of a particular tooth-colored filling. A new tooth-colored filling should feel and look natural, like your own teeth. It should be smooth and comfortable.